Do you wish to watch Mazhavillazhakil Amma stage show 2013 live? If you are staying either at Sharjah or Kochi buy a ticket online so as not to miss the stage show watch live. With around 80 artists representing the malayalam film fraternity would keep the stage alive with colourful programmes which can keep the audience intact. The mega show would be staged on 5th April at Sharjah and followed by Kochi on 7th April 2013. The real countdown for the greatest event of the year has begun as the program shouldered by Association of Malayalam Movie Artists (AMMA) is getting ready to reach the mass. To be held at Sharjah and Kochi, this show would be a visual feast as the superstars of malayalam film industry perform before your eyes. The mega show would be staged on 5th April at UAE Sharjah cricket stadium followed by Port Trust Stadium at Kochi on 7th April 2013. Mazhavil Manorama which has bagged the exclusive satellite rights to telecast the show is reported to have spend 6 Crores and 10 Lakhs while the overall expense is calculated to be of 10 Crores. The name "Mazhavil Azhakil AMMA" coined by Nedumudi Venu would be a tribute to the Indian cinema which has completed 100 years. As the show under the leadership of AMMA is being conducted after a gap of 3 years, excitement and expectations are on the peak with the movie fans gearing up to watch the extravagant event live before their eyes. 80 top most artists representing the malayalam movie fraternity would perform before the full packed audience which is being directed by T K Rajeev Kumar. The art direction of the show is safe in the hands of Sabu Cyril. With the shooting of movies halted from 25th March, actors were busy rehersing for the show at Abad Plaza hotel at Kochi. The exciting part would be the presence of acting legends Mohanlal and Mammootty. Adding more excitement Mohanlal will dance to the tunes of South Korean pop idol Psy's Oppan Gangnam style. As almost all malayalam actors being a part of the mega show, it was a herculean task for program director T K Rajeev Kumar to ensure due space for all of them. To make use of all artists, a concept was developed with the entire show splitting up into different parts. Based on a fictional village, the stage is set for a temple, an old theatre and a local arts and sports club which features simultaneous showcase of festival celebrations at the temple, the movies run in the theatre and performances at the club. The theateric concept is to pay tribute to 100 years of cinema, while the club would feature various art forms and the temple with spiritual connection. The comedy skit would be helmed by director Priyadarshan who has a flavour of handling homour at its best. Actors including Prithviraj, Indrajit, Bhavna and Meera Jasmine will be performing live with mouth watering dance sequences. Another attraction would be the sole performance of Dileep with his 'Sound Thoma' style dance. The four and a half hour mega show is being conducted to raise fund for AMMA's welfare scheme providing financial support for the needy artistes. 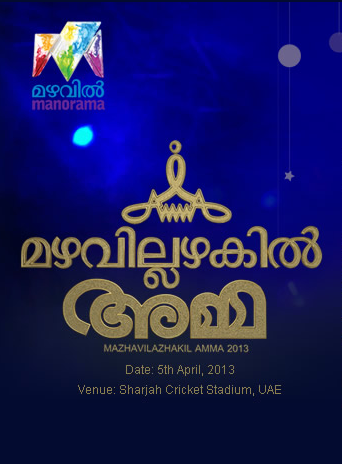 Mazhavil Manorama will be telecasting the show at convenient dates at the end of April 2013. Asianet TV is a general entertainment Malayalam channel which broadcasts programs catering to all visual departments such as reality shows, serials, news shows, travel shows, comedy shows etc. Read this article to know all the details of Asianet TV along with information such as the programs broadcasted by Asianet, official website and contact address of Asianet TV Malayalam channel. Asianet Ponnonam 2011 Dubai Mega Show will be tetecast today(11th September 2011). Asianet telecasted special Onam programs for their audience. As part of this, on Chathayadinam they will telecast the Onam mega event “Ponnonam 2011” that was held at Dubai. The show will be at 4.30pm. Watch Ujala Asianet Film Awards 2012 on television or check the websites which stream Asianet online. The Ujala Asianet Film Awards 2012 will be telecast on Asianet on 21st and 22nd January from 6.30 PM onwards. This would be the grandest program in 2012 which you never can miss. Asianet Ningalkum Akam Kodeeshwaran is an upcoming game show anchored by actor Suresh Gopi which has been adapted from the most popular game show ‘You can become a millionaire’. Watch Dasettan at 50 mega show on Asianet on 25th and 26th February 2012. You can watch Dasettan @ 50 mega show online or on television. This show was arranged by Asianet to respect the musical maestro who had completed 50 years in the music industry. Emmanuel Silks will be the title sponsor of the event which is powered by Travancore Buildings.